What has made the collaborations between director Edgar Wright and his muses/stars/sometimes co-writers Simon Pegg and Nick Frost so memorable is the fuzzy warmth their imperfect but ultimately good-hearted characters so easily beam on to their audiences. It isn't the tonally perfect genre send-ups. It's that we want Shaun to find a way to make his relationships with his best friend Ed and his girlfriend Liz co-exist in Shaun of the Dead. It's that we want Nick and Danny to adopt some of each other's best characteristics in Hot Fuzz. The World's End is no different in this regard from their past works. But films like it are ever rarer in the broader mainstream comedy landscape. I'm not sure where it started (Anchorman? Billy Madison? ), but at some point our comedic leads had to almost universally became either terrible people or decent people who did reprehensible things in the name of a few chuckles that moved the story along. It's ubiquitous now -- see The Hangover movies, Identity Thief, This Is the End, Admission or We're the Millers if you need proof of this trend. 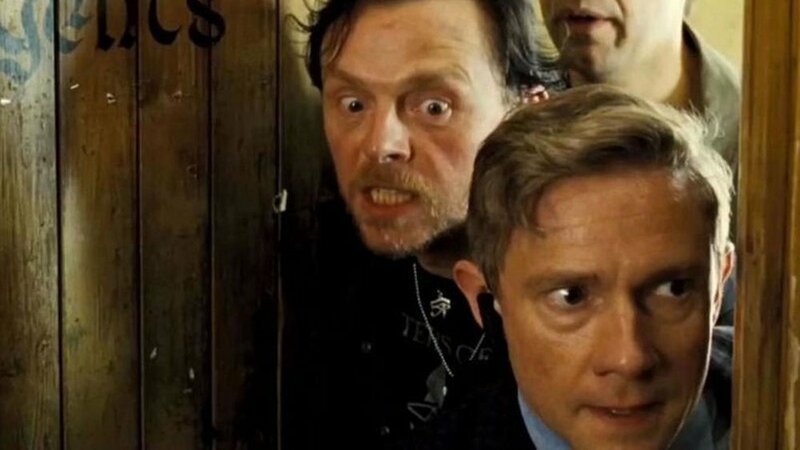 Anyway, the point is that the characters in The World's End, like its predecessors in the Three Flavours Cornetto trilogy, are different. Oh, they're flawed -- deeply. Pegg plays Gary King, an aging alcoholic stuck on the glory days of his youth, who, through a series of fibs, manages to convince his mates from those days to get back together and return to their hometown so they can take another run at the Golden Mile -- an epic 12-stop pub crawl that ends at the establishment that gives the film its name. You might now be thinking that a lying alcoholic sounds more like the pervasive terrible-person comedic leads I was just complaining about. Well, no. Gary is a sad character, but he's not poorly intentioned. He's lonely and he misses his estranged friends. Who can't empathize with that? He might be Wright and Pegg's most flawed of characters to date, but he's not an incorrigible shithead merely for the sake of comedy. There's plenty to like about him; how else to explain the fact that all his friends show up for the pub crawl despite their reluctance? Three or four pubs in, Gary's inherent likability gives way to his more grating traits, threatening to cut short his fragile reunion with Andy (Frost), Peter (Eddie Marsan), Oliver (Martin Freeman) and Steven (Paddy Considine). But an Invasion of the Body Snatchers/Stepford Wives-esque twist forces the gang to stick together despite Gary's antics, and it's at that point that you're really off. As in Shaun of the Dead and Hot Fuzz, a life-threatening crisis manages to keep the characters we all like individually working together at the exact moment when they seem sick of the sight of each other. The conclusion to The World's End isn't neat and tidy as with its predecessors. In fact, it's a bit of a hulking, stumbling mess, especially relative to those films. That only matters in comparison, though. This is the best pure comedy I've seen this year (The Kings of Summer I'd put in a slightly different category), and it seems very possible that it won't be knocked from its perch.